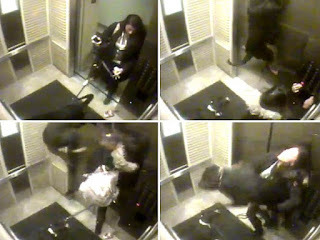 Rottweiler Dog Survived Elevator Hanging ! A terrible story happend in Toronto last month. A Toronto dog owner had to act fast when her Rottweiler’s leash got stuck in the elevator doors, causing him to be pulled up by his neck and almost choke to death. The five year old Rottweiler named Vado would die for sure if the owner Tamara Seibert wouldn't manage to free her choking dog from his collar. Mrs.Seibert broke two fingers in the process, but thank god she managed to save the poor dog. Seibert entered the elevator on the 11th floor of her Toronto apartament with Vado and a dog she was watching for a friend when the leash became trapped. She hit the emergency buttons and immediately started trying to free him and fortunately the leash finally snapped. Seibert posted this on Facebook Page: “I thought I was about to lose the love of my life (my puppy) and seriously mangled my hand in the process. I am posting this because thank god my dog survived, but I want to warn people how fast something so simple can go horribly wrong. I never want anyone else to ever go through this. You can’t see my face but I’ve never been so hysterical in my life. Please be careful with your dogs leashes because things can go wrong really fast if you are not careful"